See my other one-pot meals for more inspiration on how to use up left-over ingredients. You can pair this recipe with my crispy salmon or herb pork chops. Ingredients in my pantry and fridge. Crisp up prosciutto pieces and set aside. Mix vegetables, balsamic vinegar and olive oil in a roasting dish. Heat oil over medium heat in a small pan. Add the prosciutto pieces and cook until crisp. Remove with a slotted spoon to a plate and set aside. 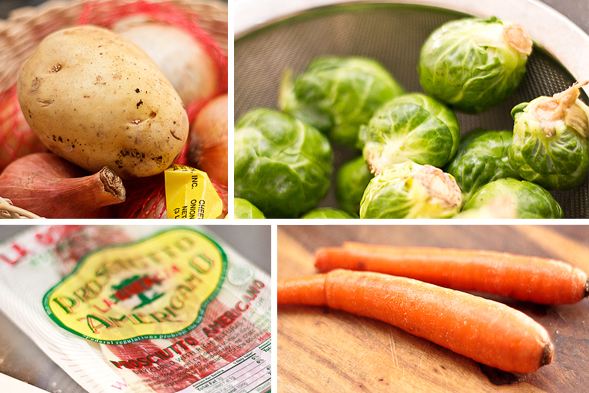 Place the Brussels sprouts, potato, carrots, onion and garlic cloves in a roasting dish. Pour in balsamic vinegar and olive oil. Season with salt and pepper and mix well. Cook for about 40-45 minutes, stirring mixture halfway to evenly brown. When finished, place vegetables on serving platter and top with crispy prosciutto. 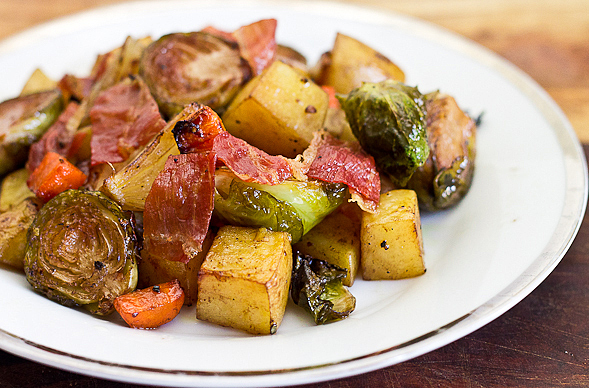 Roasted vegetables are always a great addition to any dish. They look so good! I agree, roasting veggies is so delicious and easy. Thanks, Ben! I’m making this tonight! We love brussel sprouts in our house. I usually cook them stovetop so this will be a time saver. What a great idea to add balsamic to it for a little sweetness. PS- I’ve saved so many of your recipes in my inbox. You’re my go-to for dinner inspiration. We seem to appreciate the same kind of rustic, flavorful dishes! Awesome! 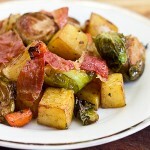 I love brussels sprouts too, let me know how they turn out. And thank you, I feel so honored to be your go-to person for your dinner inspiration 🙂 I do appreciate rustic, simple dishes very much! Oh good! I’ll probably add more garlic next time too 🙂 I love how sweet they get when they’re roasted in the oven, yum. What size baking dish did you use? Ours is fairly small and not sure how thin veggies should be distributed. Sounds so yummy! It’s a 13×9 baking dish. 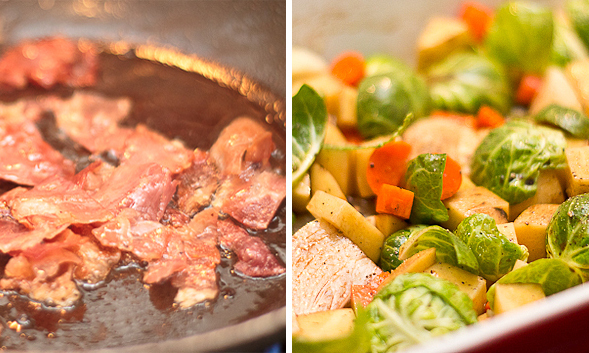 If you stir the veggies regularly, you can probably use your pan and won’t need to spread too thin.